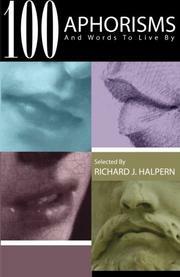 In this collection of short quotes and brief bios, editor Halpern culls words of wisdom from a variety of eras, spanning themes and virtues. This short collection, categorized and ordered by specific themes—money, knowledge, action, etc.—delivers wise sayings from late and great thinkers, writers, actors and other famous figures, from Alice Walker to Jean-Jacques Rousseau. Halpern selects poignant quotes that speak in memorable ways about universal truths. Each topic is paired with at least one insight from a well-known thinker: For example, Ezra Pound pontificates on the purpose of poetry, while Joseph Addison and others expound on happiness and the ways in which it is achieved. The quotes are accompanied by short biographies of each speaker that shed light on their experience, breadth of knowledge and credibility. Illustrated with black-and-white versions of famous paintings and drawings after every few quotes, the collection allows room to absorb concepts and to sometimes apply a more abstract expression of an idea. For example, Edvard Munch’s The Scream accompanies two quotes about life, tolerance and longevity. Halpern also selects a few quotes from anonymous sources, demonstrating that words can be powerful even without a historically significant name behind them. The book will appeal to readers looking for quick inspiration—e.g., H.L. Mencken: “You can’t do anything about the length of your life, but you can do something about its width and depth”—though it may not satisfy those reaching for deeper, more specific ideas. The organizing principle of selecting 100 aphorisms that span 34 topics delivers quick, easily digestible statements but tends to brush the surface of each theme. Perhaps in subsequent collections the author could home in on a virtue and expand the field of influence to great thinkers across borders, genders and disciplines. A well-organized but not especially nuanced collection that could deliver conversation starters and go-to sayings for speeches and public lectures.